The Far East and Asia is in a state of perpetual boom when it comes to luxury hotel openings - and this looks set to continue well into the next decade. Here’s our round-up of the region’s best high-style boutiques and head-turning resorts - all of which assure sophisticated accommodation, doting staff, and locations that are ripe for exploration. The scene: With the River Ayung as a soul-stirring backdrop, this contemporary all-villa resort continues to see off its competitors with a flawless blend of fabulous facilities, classic Balinese design touches, gracious hospitality, and cinematic views. The artistic and cultural hub of Ubud is just 15-minutes away (a free shuttle service is available on demand, based on car availability). 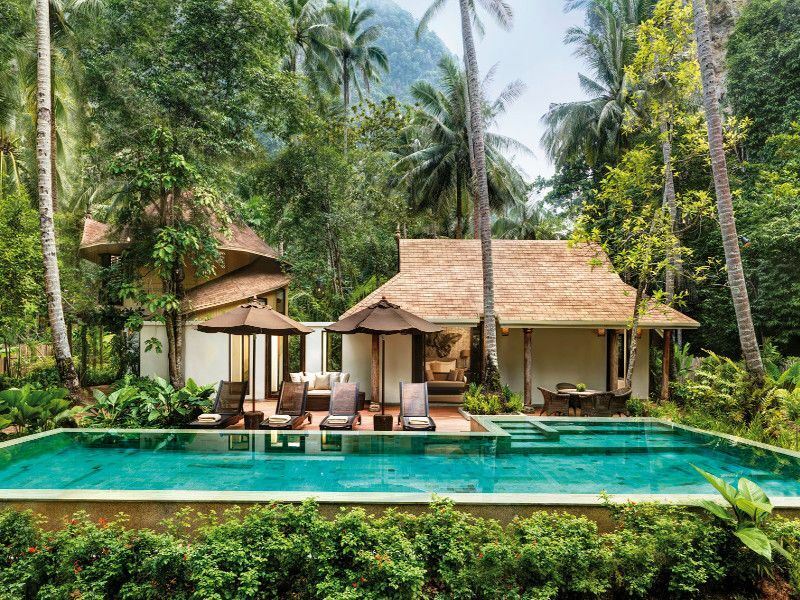 The sleep: All of the 19 sleek and spoiling villas dotted along the hillside or next to the river come with their own full-size swimming pool set in lush tropical gardens. There’s also spacious indoor and outdoor areas, king-size beds dressed with crisp white linens, flatscreen TVs with digital channels, Wi-Fi access, and indulgent bathrooms with designer toiletries. You’ll also be assigned a private butler to ensure your stay here is as stress-free as possible. The stay: For those on a go-slow, this place seals the deal with gentle activities such as cycling, hiking, guided nature walks, and morning yoga sessions. There’s a state-of-the-art spa for holistic therapies and feel-good beauty treatments, a gym for daily workouts, and cooking classes for foodies keen to lean local tricks and techniques. For wining and dining thrills, head to Scene for hearty breakfasts and lavish afternoon teas and Swept Away for relaxing lunches and romantic dinners with flower petals and candles. An in-villa menu is also available. The scene: Once you’ve made your Bond-like entrance by speedboat from the nearby Krabi Pier, this award-winning sanctuary rewards with three postcard-perfect white beaches, turquoise-tinted Andaman waters, and a rather glorious setting on the tip of the Phranang Peninsula. As you’d imagine, everything here is fantastically tropical and private. The sleep: Part of Krabi’s esteemed Rayavadee Resort, there’s just four seriously stunning beachfront villas - all with private pools. 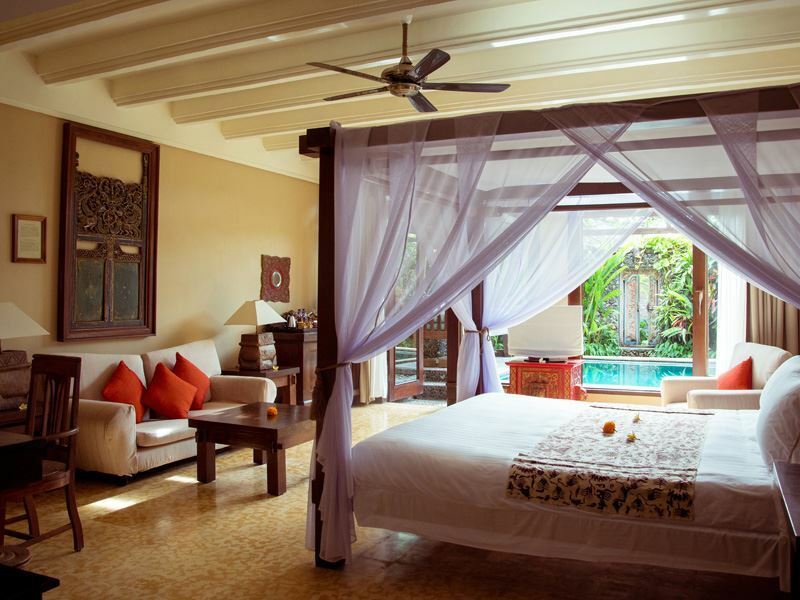 Varying in size and layout, each has lashings of Balinese décor (dark woods, whitewashed walls, neutral hues) cushioned daybeds, bathrooms with oversized tubs, high-end toiletries, and beautiful bathrooms. Flatscreen TVs, Wi-Fi access, tea and coffee-making facilities, and the services of a dedicated butler complete the luxe touches. The stay: You’ll have access to all resort facilities: heavenly spa, well-equipped gym, two tennis courts, and a good choice of watersports (canoeing, windsurfing, sailing, snorkelling). There’s also four special places to eat: Raya Dining for global-spanning meat and fish dishes created with fresh and locally-sourced ingredients, Krua Phranang for Thai dinners overlooking the sea, Raitalay Terrace for daytime snacks and poolside meals, and The Grotto for light bites, masterfully-mixed cocktails, and nightly barbecues (reservations are required). The scene: Stellar views of the East Vietnam Sea dominate at this ultra-chic and perfectly secluded resort set in a crescent-shaped bay and surrounded by towering mountains, impressive rock formations, and brilliant white sands. 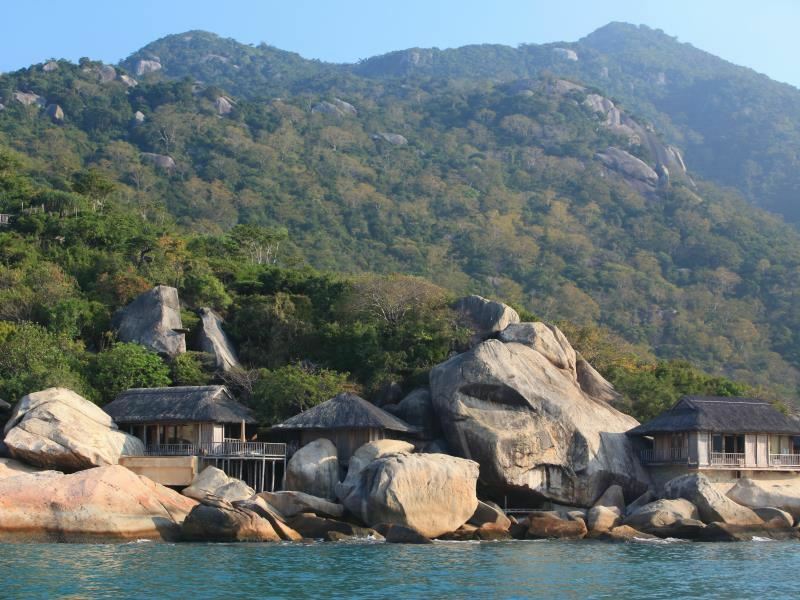 It’s roughly 20 miles from Cam Ranh International Airport to the private jetty, from which you’ll hop on a speedboat for the remainder of the journey. The sleep: All of the 58 villas either along the beach or nestled in the hillside have their own private pool (some have ladders for direct sea access). Expect rustic yet resolutely sophisticated décor, open-plan living spaces, large beds with luxe linens, in-room gadgetry (free-to-borrow iPods, DVDs, flatscreen TV with digital channels, Wi-Fi access), and in-villa wine cellars. En-suite bathrooms have handcrafted wooden bathtubs and separate vanity areas. The stay: As you’d expect from a property in the Six Senses portfolio, attention to detail is everything. Days can be spent taking yoga classes in the hills, booking pampering treatments in the spa, and making the most excursions such as waterfall visits, island-hopping tours, guided hikes, diving, and snorkelling. There’s also several unique restaurants and bars, including Dining by the Bay for Asian-Western breakfasts and international fusion dinners, Dining by the Pool for casual lunches and flavoursome snacks, Dining by the Rocks for prime meats and seafood, and Drinks by the Jetty for sundowners and sommelier-guided shisha and wine pairings. The scene: You know you’re in for a luxurious treat when you arrive at this stylish boutique courtesy of a vintage Mercedes Benz airport transfer. What follows is a combination of French colonial and modern design, efficient service, and a central Siem Reap location just a 10-minute tuk-tuk or taxi ride from the Old Market and 15 minutes from Angkor Wat. The sleep: There’s 26 recently-refurbished guest rooms, most of which are open-plan living spaces with private walled gardens, seating areas, and palm-shaded rainshowers. Amenities include king-size beds swathed with luxe linens, flatscreen TVs with DVD players (laptops are available on request), minibars, and espresso machines with 100 per cent Arabica coffee. Bathrooms have oversized freestanding stone bathtubs (some have private steam rooms). The stay: Once you’ve marvelled at the world’s largest religious monument, head back to this stylish bolthole to laze on sunloungers around the spacious saltwater pool, enjoy all manner of beauty rituals and signature treatments with natural products at the lovely spa, and enjoy drinks and weekly jazz nights at the downstairs Cocktail Bar & Lounge. Also worthy of your attention is The Heritage Restaurant - a fine dining spot with Asian and French dishes paired with excellent wines. You can also enjoy Aspara dancing on Tuesdays from November to March. 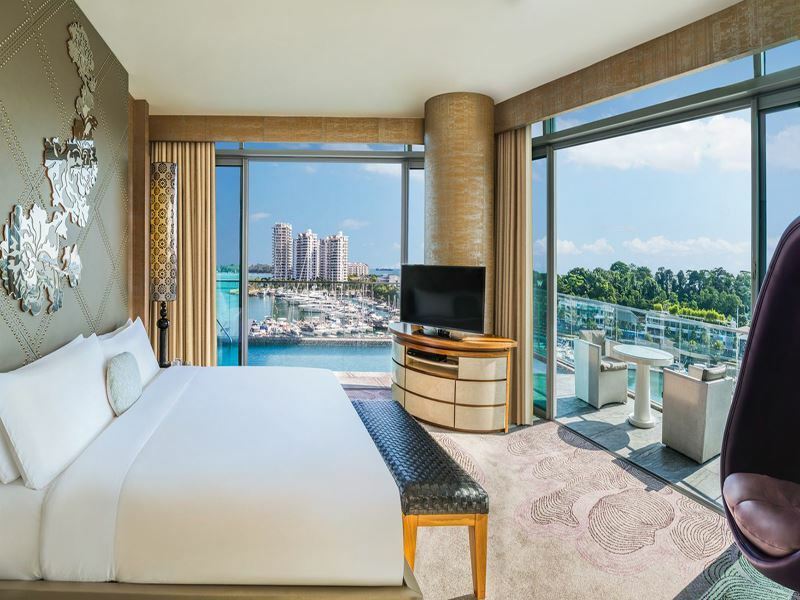 The scene: It’s all high glamour and South China Sea views at this ultra-sleek offering from W - Marriot’s trendy lifestyle hotel chain. Surrounded by emerald-green foliage, sparkling sands, and an upscale marina, you’ll be staying in the island enclave of Sentosa Cove, just 30 minutes from Singapore’s Central Business District and the Insta-worthy Gardens by the Bay. The sleep: All of the 240 individually-designed guest rooms and suites have names such as Wonderful, Fabulous, Spectacular, Marvellous, Fantastic, and Wow. Expect vibrant modern décor, mood lighting, and insanely comfortable W pillow-top beds with 350-thread-count sheets, down comforters, and pillow menus. There’s also 40-inch Samsung TVs, DVD players, iPod docking stations, Wi-Fi access, well-stocked minibars, and French press coffee makers. Bathrooms have rainforest shower, bathtubs, Bliss Spa six bath amenities, and fluffy robes. The stay: You’ll have access to a wealth of facilities, including a huge outdoor pool fitted with underwater speakers that emanate a surreal series of sonic waves. There’s also a sumptuous spa with a deep treatment menu and a striking-looking gym with state-of-the-art cardio machines, free weights, and strength training equipment. Elsewhere, there’s Woobar for cool cocktails and posh afternoon teas, The Kitchen Table for all-day international buffet fare, and Skirt for prime cuts of meats (a parrilla grill fuelled with mesquite wood is used to cook the steaks). 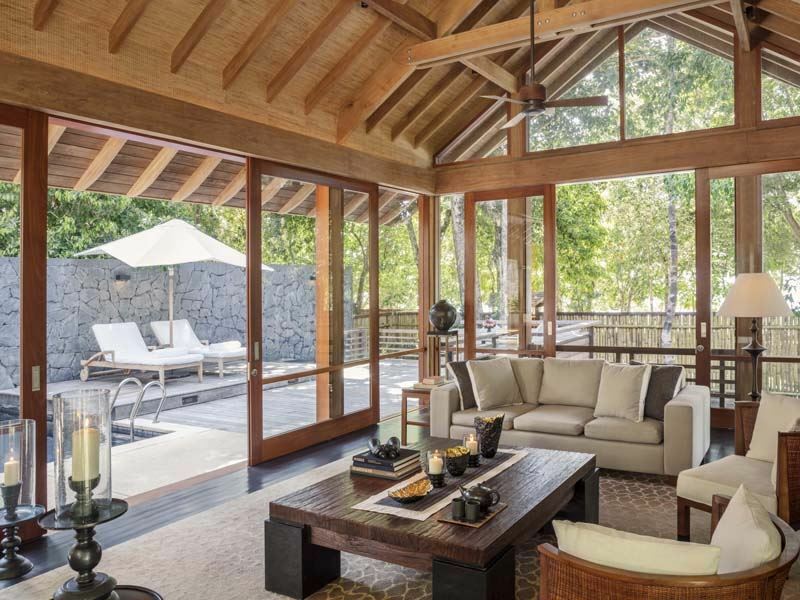 The scene: Luxury finds its home at this idyllic resort bordered by a 10-million-year-old rainforest and the dreamy white-sand Datai Bay (one of the world’s top 10 beaches, according to National Geographic). Whilst just 40 minutes from the Langkawi International Airport, everything here taps into nature (expect to see Dusky langurs, Tokay geckos, and Sunda colugos during your stay). The sleep: The 121 guest rooms and suites are classified according to location: The Canopy Collection overlooks the rainforest, The Rainforest Collection is laid out along the stream, and the Beach Collection is on the Datai Bay sands. All have delightful views (some stretch to Tarutao Island on the horizon), a private pool, full butler service, and top-notch room amenities such as flatscreen TVs, free Wi-Fi, tea and coffee-making facilities, minibars, and personal safes. The stay: The restaurants will appeal to discerning foodies keen to savour regional dishes paired with fine wines. 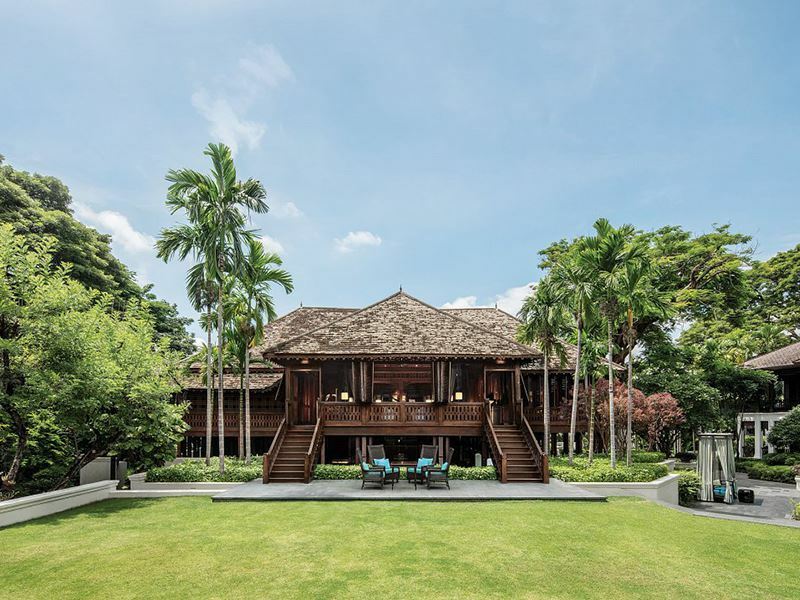 Head to The Gulai House for authentic Malaysian fare, The Pavilion for traditional Thai cuisine, The Beach Club for hand-tossed pizzas and seafood, and The Dining Room for Western specialties at breakfast and fine French cooking at dinner. There’s also a spa with signature treatments incorporating healing rainforest plants and herbs, a state-of-the-art health club, and three beautiful outdoor pools (including one just for grown-ups). The scene: The spoil-you factor is high at this award-winning resort on the island of Koh Lanta Yai, just off the south-west coast on the Andaman Sea. Catering just for adults, it can be reached from Krabi Airport in 90-minutes by car and ferry (or four hours from Phuket Airport). Speedboat transfers are available between November and April, subject to weather and sea conditions. 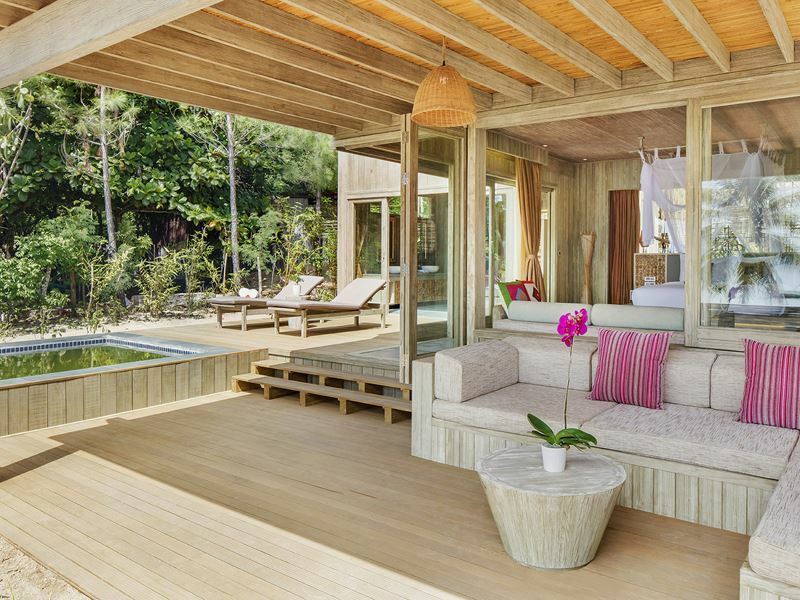 The sleep: A sleep of dreams is promised in 57 wow-factor guest rooms, suites and villas - all of which are scattered amidst verdant foliage just a few steps from the shore. Amenities include minimalist Thai décor, king-size beds with luxe linens, goose-down duvets and a choice of pillows, open-air rainshowers, private balconies for uninterrupted panoramas, and all mod cons. Bathrooms have separate glass-enclosed showers, sunken bathtubs, and luxe toiletries. The stay: While the saltwater infinity pool will keep you happy for hours, there’s also a high-tech gym with cardio equipment and optional personal training sessions, a yoga platform for classes every Monday, Wednesday and Friday, and an outstanding spa for aromatic massages, scrubs, body treatments, and facials. Equally standout is SeaSky for contemporary Thai and light Mediterranean cuisine, The White Bar for health-boosting smoothies and snacks, and Sundowners for cocktails, craft beers, and a wide selection of gins (and tonics). 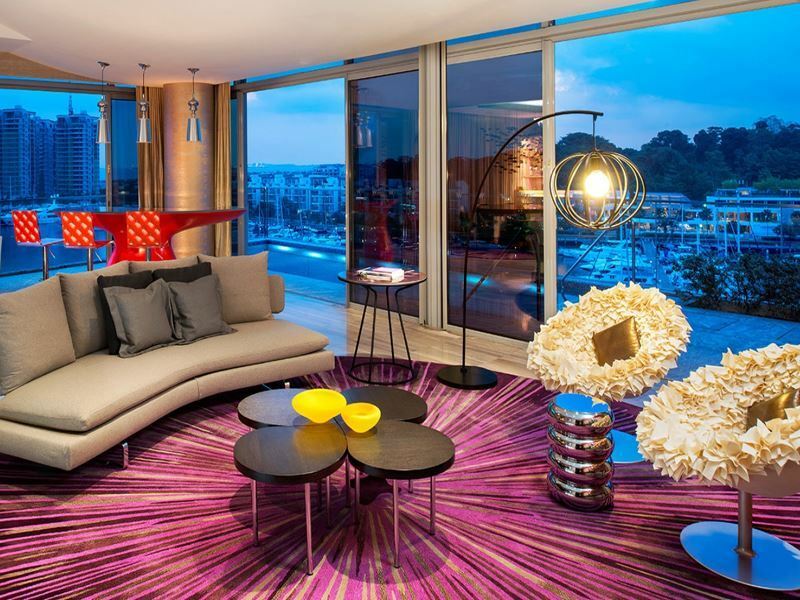 The scene: Set directly on the Saigon River, this small boutique with the amenities of a luxury resort is a 15-minute speedboat ride from Vietnam’s former capital, Ho Chi Minh City (still known as Saigon). The location is spot-on for those keen to spend time in this high-energy metropolis famous for its French colonial architecture, landmark markets, and wonderful food stalls. The sleep: There’s just 19 spacious suites and villas, spread across tropical leafy grounds with birds-of-paradise plants, hanging lanterns, and bespoke sculptures. Complete with butler service, all are relaxing havens with contemporary décor, plush king-sized beds, cushioned rattan chairs, minibars, espresso machines, and furnished balconies or terraces. Some of the larger accommodation feature private plunge pools, outdoor bathtubs, and river-facing decks. The stay: Once you’ve worked your way around Saigon’s wonders (don’t miss the Saigon Opera House, the Reunification Palace, and the Vietnam History Museum), retreat here to park yourself around the central pool. There’s also a spa for bliss-bringing treatments and therapies, a gym for daily workouts, and activities such as yoga, cookery, and jogging around the Saigon River. When hunger calls, head to Tram's Cookery for mouth-watering gourmet Vietnamese dishes and riverbank views. The hotel also has a wine cellar for vintages and a champagne bar for bubbles. The scene: Train travel through India heartland of doesn’t get more opulent than the state-of-the-art Maharajas’ Express - a “luxury hotel on wheels” for wannabe mararajas (kings) and maharanis (queens). Everything about this 8-day journey is worth the price tag; not least rolling from Mumbai to Delhi and enjoying stops at some of the country’s most awe-inspiring places. The sleep: Designed for a maximum of 88 guests, the fit-for-royalty accommodation (Deluxe Cabin, Junior Suite, Suite, or Presidential Suite) is available in carriages named after precious stones. All afford grandiose décor, king-size beds, Wi-Fi access, flatscreen TVs with DVD players, electric safes, private bathrooms, and attentive service from round-the-clock butlers. There’s also large panoramic windows for savouring every bit of the enchanting journey. 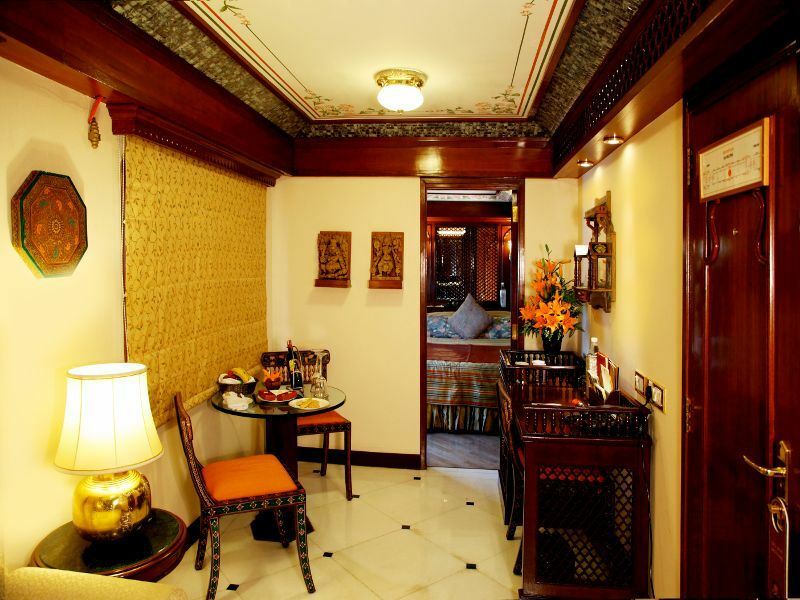 The stay: In addition to an enviable roll call of destinations (Mumbai, Ajanta, Udaipur, Jodhpur, Bikaner, Jaipur, Ranthambore, Fatehpur Sikri, Agra, and Delhi), guests can enjoy two fine-dining spots: Mayur Mahal (Peacock Restaurant) and Rang Mahal (Haveli Restaurant). Further facilities include the well-stocked Safari Bar for global-spanning wines and creative cocktails, the Rajah Club for a selection of board and card games, and the Maharajas Club for a library, souvenir shop, and relaxing chairs from which you can watch the landscape whizz by. The scene: Just over seven miles from central Seminyak and Tanah Lot, this eccentric boutique is located in the up-and-coming coastal area of Canggu Beach - a surfing hotspot with a wide stretch of black sand. The owner is a collector and curator of fine Balinese art and antiques (Tugu translates as Monument), so the interiors are as museum-worthy as it gets. The sleep: Given the owner’s love of art, history and culture, all of the 21 suites reveal theatrical but tasteful décor. There’s a clever mix of classic and contemporary design elements, interesting objects d’art, four-poster beds with high-quality linens, flatscreen TVs with DVD players, and free Internet access. You can also look forward to artisan-crafted bathrooms (indoor or outdoor), private balconies, and well-stocked minibars (some suites have private plunge pools). The stay: Private beach access will please those keen to spend their days lying horizontally in the sun. There’s also a private pool with sunloungers, a great spa for all sorts of spirit-soothing Balinese treatments and therapies, and library for free-to-borrow books, DVDs and music, and organised activities such as cookery classes and flower arranging. A handful of restaurants complete the deeply seductive experience, including Tugu Bali Restaurant, Terrace By The Sea, and Ji at Bale Sutra for fully-blown Japanese, Indonesian, or Far East feasts. The scene: The former residence for Louis Leonowens, whose mother Anna’s life was fictionalised in Rodgers and Hammerstein's musical, The King and I, this 19th-century colonial homestead turned boutique hotel is located in Chiang Mai’s arty Wat Gate area. You’ll be just a 10-minute tuk-tuk ride from the Old Town and 15-minutes from the famous night bazaar. The sleep: Overlooking tropical gardens, the 30 expansive suites pile on the luxe with hardwood flooring, high ceilings, king-size four-poster beds dressed with 400-thread-count bedlinen, dressing rooms with walk-in wardrobes, flatscreen TVs, and large terraces with daybeds and signature rattan rocking chairs (some also have private pools). The huge bathrooms have freestanding claw foot Victorian tubs, plush bathrobes, and indoor and outdoor showers. The stay: An ideal base from which to combine city meandering with well-deserved relaxation, the facilities leave a lasting impression; mostly the piano lounge, bar with retro cocktail menu, well-stocked wine cellar, and two flagship restaurants for Thai and European cuisine. There’s also a 25-metre-long heated lap pool, a three-room spa, a small library, and a state-of-the-art gym. The hotel has a cheery concierge team who can organise cycling trips, cookery courses with gourmet chefs, and cultural sightseeing tours. The scene: Set on a secluded cove between the white sands of Ninh Van Bay and the jungle-clad mountains, this accessed-only-by-boat resort is ideal for fly-and-flop luxury close to Nha Trang - the spirited coastal hub famous for its cobalt-blue waters, diving sites, offshore tropical islands, and ancient ruins. Nha Trang Airport is an 80-minute drive away. 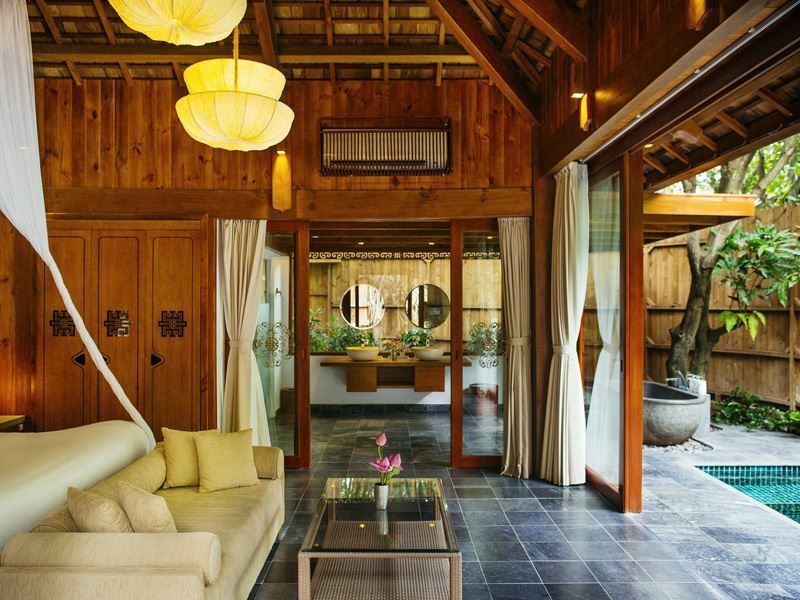 The sleep: There’s 34 luxurious and spacious timber villas, all with contemporary Vietnamese décor, private butlers, balconies or terraces, and far-reaching beach or mountain views. All accommodation types have elevated king-size beds dressed with crisp white linens, flatscreen TVs with digital channels and DVD players, minibars, coffee machines, and free Wi-Fi. Bathrooms have rain showers, deep-soaking bathtubs, bathrobes and slippers, and toiletries. 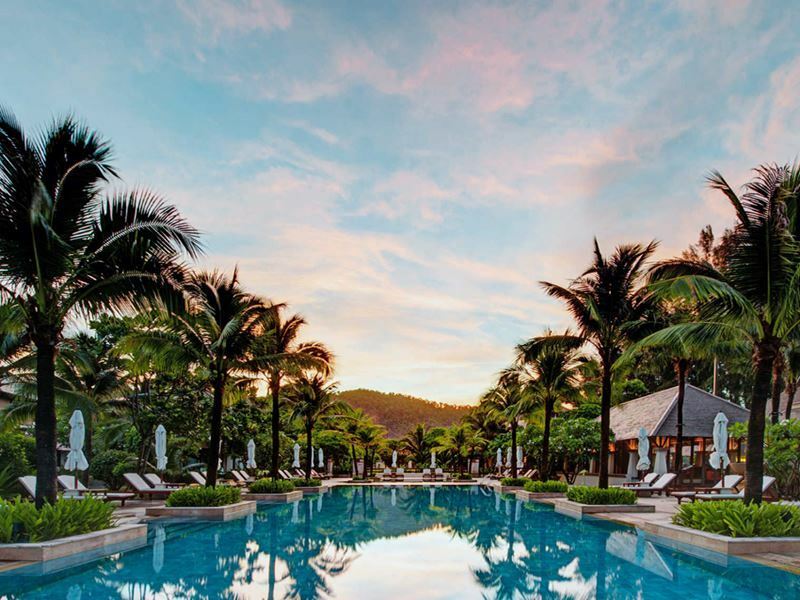 The stay: Given this island hideaway prides itself on being the first adults-only resort in Vietnam, the vibe is joyously peaceful - especially for loved-up couples and honeymooners. There’s a jungle spa with a unique fresh spring water pond for natural bathing, a gym with cardio equipment and free weights, an outdoor pool for all-day lazing, and yoga classes at selected times. But the real star is the SEN Restaurant - a chic dining space where the lotus-like design is as magnificent as the Vietnamese cuisine and the Ninh Van Bay views. The scene: Once a fine art gallery specialising in high-end Balinese and Indonesian collections, this Conde Nast Hot List-approved boutique hotel is located on Monkey Forest Road in the heart of Ubud, Bali’s cultural capital. There’s a wealth of attractions within easy distance, including temples, museums, shops, restaurants, and iconic rice terraces. 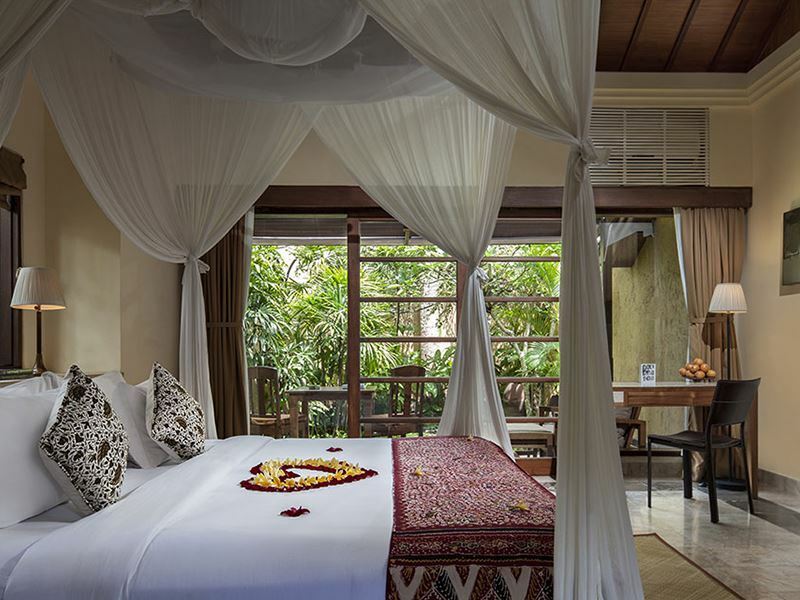 The sleep: Given the owner’s excellent taste, the suites couldn’t be more stunning; think rustic-chic Balinese décor, high ceilings, and king-size canopy beds with elegant draping. There’s also private terraces overlooking foliage-filled gardens, comfortable day beds, flatscreen TVs, and luxury bathrooms with standalone tubs. 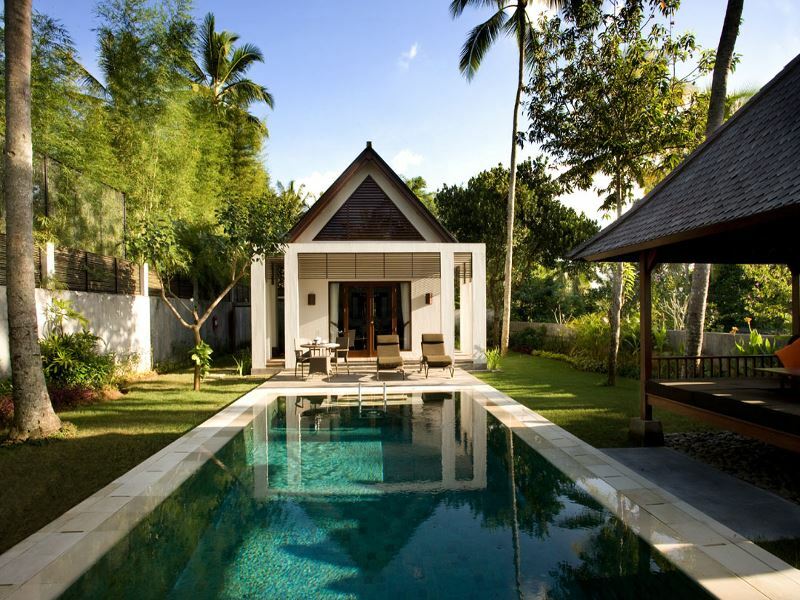 The upgraded pool villas have wrap-around garden terraces with private plunge pools, shaded outdoor lounges, and views of the rice fields. The stay: This high-end sanctuary has an outdoor pool lined with sunloungers and a standalone spa villa for facials, massages, and body scrubs that draw on ancient Indonesian herbal recipes. There’s also an intimate open-air restaurant for aromatic Indonesian cuisine washed down with juices, classic cocktails, or Komaneka's own homemade ginger beer made from fermented fresh ginger with sugar and lime juice. 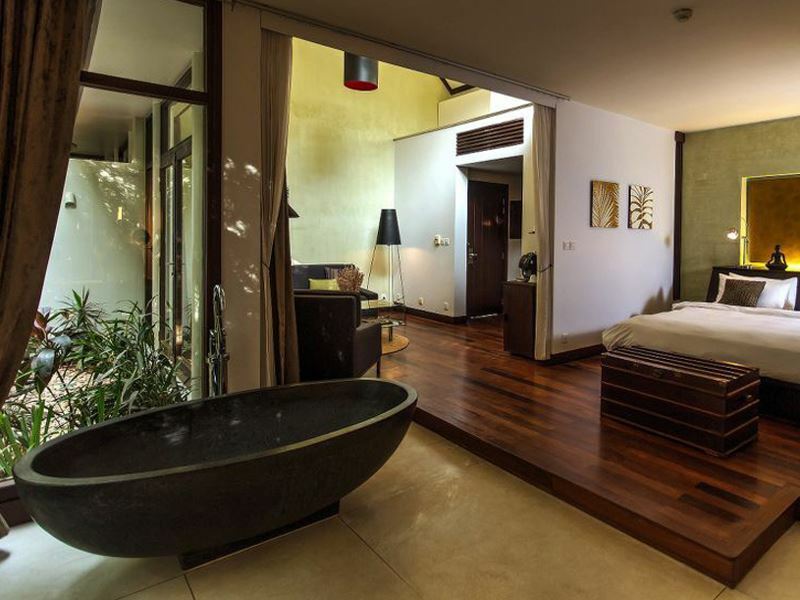 The hotel can organise picnics, cycling, walking, romantic candlelit dinners, and visits to Ubud’s Sacred Monkey Forest. 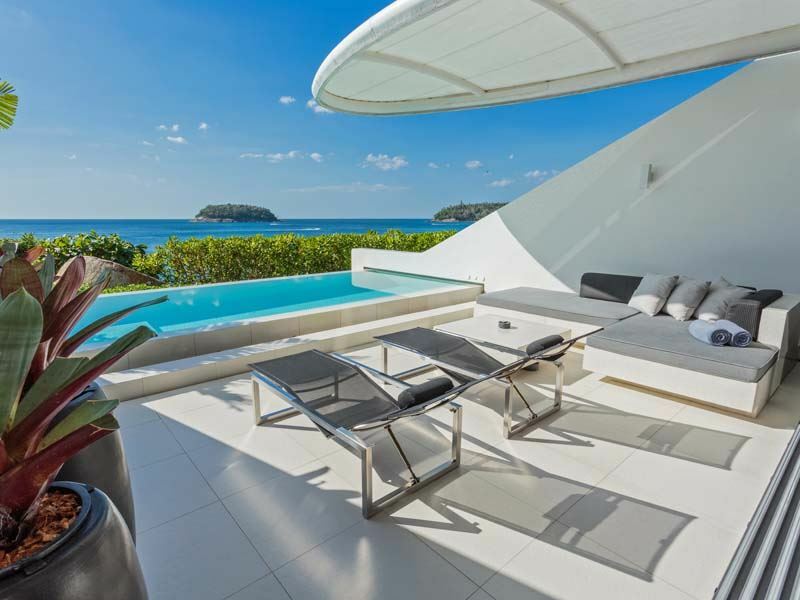 The scene: Having racked up over 40 international property and hospitality awards for its off-the-scale luxury, this superyacht-influenced villa resort is set high on a rocky headland overlooking the Andaman Sea in the west of Phuket. Two of the island’s best beaches, Kata and Kata Noi, are within walking distance. The centre of Phuket is a 20-minute drive away. The sleep: The 38 sleek, contemporary, and palatial west-facing villas all have a white-tiled infinity pool with padded sunloungers. Amenities include king-size beds with goose down bedding, oversized flatscreen TVs with digital channels, entertainment systems, free movie libraries, Nespresso coffee machines, and luxe Italian fixtures and fittings. There’s also shiny kitchens, shimmering ocean views, and plenty of indoor-outdoor living space. The stay: If you ever manage to venture beyond your front door, head to the eight-room Infinite Luxury Spa for award-winning pampering - or hit the fitness centre with its full spectrum of free weights and machines for optimal aerobic and anaerobic workouts. Also standout is the food at the oceanfront restaurants and bars; not least because the executive chef has three Michelin stars under her belt. There’s also an exceptional wine cellar where groups of up to 12 guests are offered sommelier-hosted paired cheese and wine tastings (reservations are required).